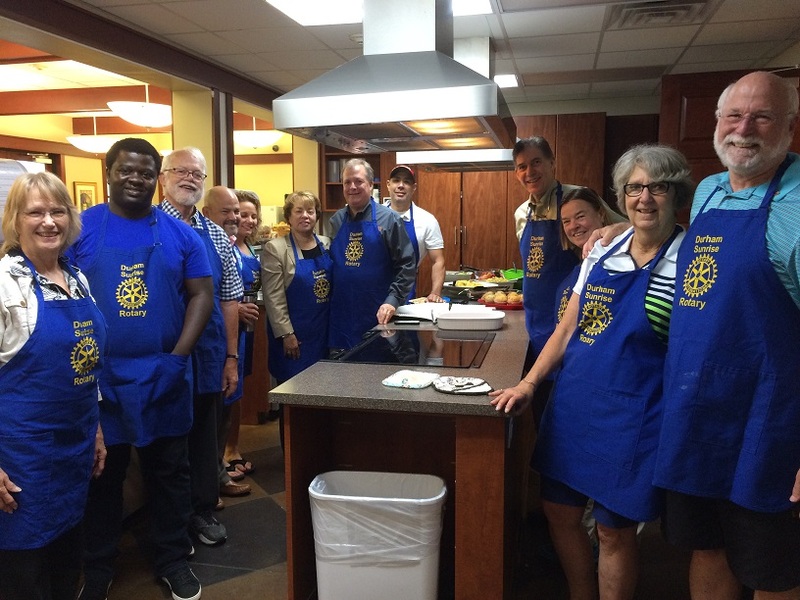 On June 13, a cadre of Durham Sunrise Rotarians, along with family members and good friends, arose early yet again to cook breakfast for UNC Hospitals patients and their families residing temporarily at the SECU Family House in Chapel Hill. With this intrepid crew, including new participants positively awake and overflowing with culinary talents — along with a core of member-veterans — we made short work of both cooking and cleanup, and a satisfying start to the day for folks not all feeling at their best. SECU Family House, at 123 Old Mason Farm Road in Chapel Hill is a wonderful outreach service of the State Employees Credit Union, which provides a comparable “home away from home” for families of ailing patients, to the Ronald McDonald House next door — but for adults undergoing treatment, rather than children. See you again in a few months !